It’s human nature to wonder what former classmates and colleagues, friends and first loves are doing these days. We’re curious if they married so-and-so, fulfilled a childhood dream of becoming a doctor or teacher, and, let’s be honest, have they changed? Social media lets us fill in the gaps, reconnect and follow their lives. Recently at the Southwest Florida Community Foundation we’ve begun following the lives and successes of the people impacted by our programs. One of our biggest thrills is seeing scholarship recipients earn post-secondary college degrees and certifications and sharing their success stories with our community. The foundation administers 88 scholarship-related funds and last year distributed $700,000 in new and multi-year awards to the freshman class of 2016, current college students and adults returning to the classroom. These funds have been established by community patrons who realize post-secondary education is an investment in the community. The community foundation has awarded $2.75 million in scholarships during just the last five years, providing financial assistance to students like 2016 Dunbar High graduate Nahisha Alabre, just wrapping up her freshman year at Cornell University. Receiving scholarship money was “a blessing upon me and my family,” said Ms. Alabre. Sharing the successes of nine present and former scholarship recipients shows how scholarships have opened a world of opportunity for thousands of Southwest Florida students. 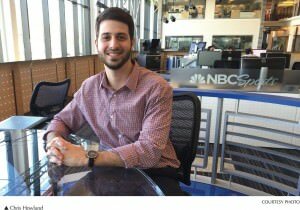 These students and young professionals have realized their dreams, including a practicing cardiothoracic surgeon, an Emmy Award-winning manager at NBC Sports, and a chief financial officer for a Texas gas and oil company. Others are working right here in Southwest Florida, including the assistant head of school at Montessori School of Fort Myers, an assistant district attorney, and the 2008 Miss Florida who now mentors young women through her church and runs a home-based business. Scholarships permanently entwine the lives of donor and recipient. As a first-generation college graduate, Ms. Williams said her bachelor’s degree in communications from Florida Gulf Coast University is “my family’s degree. They are so proud of me.” She is now working on her master’s at the University of Vermont where she received a full-ride scholarship. received a 2016 Emmy for digital innovation. He’s nominated for two 2017 awards and was recently promoted to manager of sales integration, responsible for the custom commercial advertisements users see when streaming live events. The Southwest Florida Community Foundation awards annual scholarships to students who meet a variety of criteria established by donors – from simply living in the five-county region and demonstrating a financial need to those following a certain career path or attending a donor’s alma mater. Ms. Alabre was identified in middle school as a candidate for the Jo Anne Olmsted and John F. and Mary W. Hotchkiss scholarships which the community foundation provides to the Foundation for Lee County Schools to administer. The scholarships were created in 2005 from $2 million in gifts to the community foundation and require recipients maintain good grades and stay drug and crime-free through middle and high school. Ms. Alabre, who lights up the room with her megawatt smile, was selected by her teachers and mentored through the school foundation’s Take Stock in Children program. She also received the Dunbar Heritage Scholarship and is grateful to the donors who gave her an early start. A Dunbar track standout and Lee County’s fastest woman in 2016, Ms. Alabre was also recruited for the Cornell track team. She’s majoring in human development, minoring in business and plans to pursue sports psychology in graduate school. She’ll then return to Dunbar and give back to the community she credits with supporting and guiding her to success. Erin Gillaspie and Lee Visone received money for college from the John M. and Mary A. Shanley fund, a fouryear scholarship. It helped Dr. Gillaspie realize a lifelong dream of becoming a cardiothoracic surgeon. Ms. Gillaspie was a unique candidate for scholarship – at 18 she had already achieved her high school diploma and her first college degree. The Shanley scholarship funds supplemented money Mr. Visone received through the GI Bill after serving a four-year tour in Iraq. The Marine veteran graduated with honors from the University of Florida in microbiology and is now a senior-level patent examiner for the federal government. Sierra (Minott) Jones received the George E. Judd Scholarship and supplemented it by getting involved with the Miss America program at Palm Beach Atlantic University. She was named Miss Florida in 2008 and competed at the national level the following year, finishing fourth in Miss America. “Because of the scholarship money, I completed my education debt-free,” said Mrs. Jones, who earned a master’s in seminary and returned to Fort Myers where she and her husband are raising a family. Lindsay Scott gives a voice to victims of domestic abuse as an assistant district attorney with the 20th Judicial Circuit, a career inspired by watching “Law and Order” as a child. Michael Dignam, the CFO of an oil and gas company in Corpus Christi, Texas, received numerous scholarship awards including the 2006 Sam Sirianni Athletic Scholarship and the Southwest Florida PGA Scholarship 2006. “He was recruited to play golf at Vanderbilt University where he majored in economics and Spanish. Scholarships and post-secondary education have the power to change lives for high school seniors and the growing numbers of nontraditional students returning to the classroom to finish degree or certification requirements or completely change careers. As a result, multi year scholarships that follow a student through college or technical school have become mission critical, according to Sarah Owen, president and CEO of the Southwest Florida Community Foundation. The community foundation is working with donors to establish multiyear awards and is walking alongside students throughout their degree or certification attainment. Two local professionals understand the importance of renewable scholarships. Gail Markham, founding partner of Markham Norton Mosteller Wright & Co. P.A. with offices in Fort Myers and Naples, received five four year scholarships while attending the University of Maryland. To this day, she credits the kindness of others for changing her life. As the first generation in his family to attend college, Christopher Hill qualified for scholarship money during his years at Barry University in Miami. Now a financial advisor with Wells Fargo Advisors and the vice chairman of the community foundation’s scholarship committee, Mr. Hill worked a number of full-time jobs to supplement expenses not covered. Ms. Markham established an endowed scholarship fund at the community foundation in 2013, making it available to girls in the five-county region who demonstrate financial need and have a minimum 3.0 grade point average. It’s renewed annually up to four years. The community foundation offers 88 different scholarship funds, each fulfilling a variety of scenarios. Some are broad-scoped like Ms. Markham’s. Others are more specific, awarded to students following a certain career path or attending a donor’s alma mater, for example. Some scholarships even identify students as early as sixth grade. universities can be restrictive. (www.futuremakerscoalition.com.) Money can’t be applied to summer housing, food or living expenses such as gas, transportation or even a warmer wardrobe for Florida students attending a northern school. Some financial awards may even prohibit a student from working to ensure they adapt to academic life. As part of its communication with current students, the foundation connects through students’ LinkedIn accounts. It’s also looking into creating an emergency fund to help students facing potential drop-out crises, Mrs. Owen said. According to the National Center for Education Statistics, about 60 percent of students who were freshmen at a four-year institution in 2008 had graduated by 2014.
unexpected $100 expense could mean the difference in completing a semester. The Southwest Florida Community Foundation provides a number of creative ways to establish scholarship funds. Donors can establish them in memory of a loved one, a favorite school or alma mater or specific subject, and also request donations be made to their funds in lieu of birthday gifts or to commemorate other milestones. — Interested in establishing a multiyear scholarship? Contact Carolyn Rogers at the Southwest Florida Community Foundation at 239-274-5900, email [email protected] com or visit us at 8771 College Parkway, Building 2, Suite 201 in Fort Myers. More information can also be found online at www.floridacommunity.com.